One great way to donate is to Adopt A Shelf. 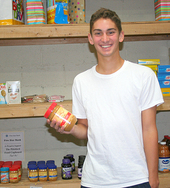 Individuals and community organizations can partner with the Pittsford Food Cupboard by taking responsibility for a shelf. This means the organization helps to ensure items in a chosen food category (e.g. jelly, cereal) are in good supply for a committed amount of time. Stocking can be done by collecting food or through a financial contribution. 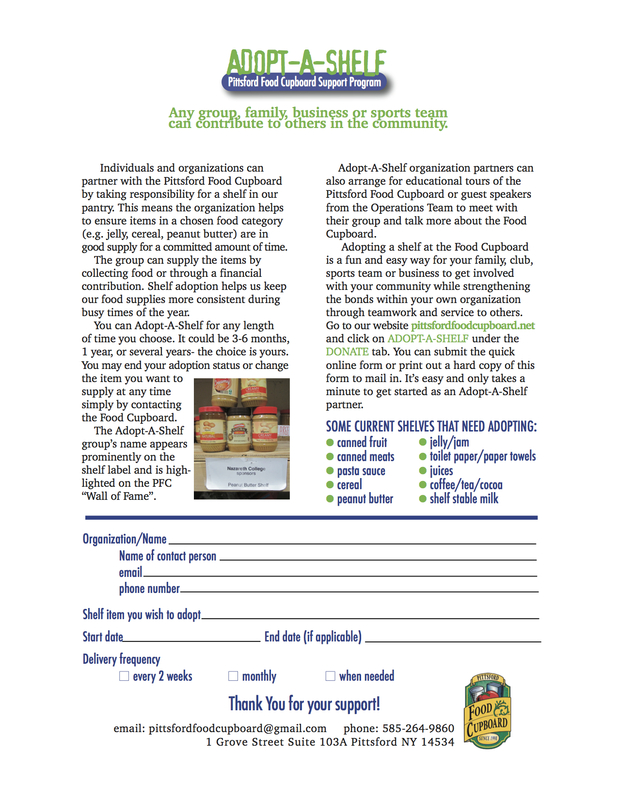 Adopt-A-Shelf organization partners can also arrange for educational tours of the Pittsford Food Cupboard or guest speakers from the Operations Team to meet with their group and talk more about the Food Cupboard. The original Adopt-A-Shelf program generally runs 1 year or more. We have 2 other programs for shorter or more varied donation. You may end your adoption status or change the item you want to supply at any time. This modified program is for a shorter period but a minimum of 3 months. Best for seasonal sports teams, school clubs, church youth groups. To encourage regular donations from individuals, families and small groups. Collection is suggested weekly or bi weekly. form at right or the online form to get started as an Adopt-A-Shelf, Support-A-Shelf or Frequent Donor partner. Print out this file and mail it in to PFC or use the online form below.